By 3:00AM I had the 2 GB file downloaded. After a few error messages I finally got the file transfer to the GPS started and I went back to bed. By morning I was in business and plotted the route to Carlsbad Caverns National Park. The Caverns should be on everyone's bucket list. As a child my family had a ViewMaster with 3D photos of the Cavern. 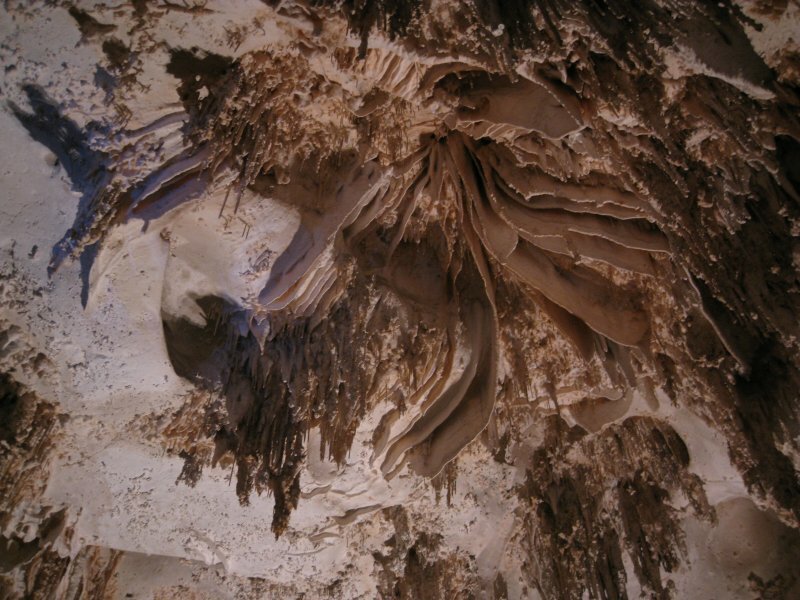 However, those tiny 16mm photos don't do justice to the colossal size of the cave's rooms. We took the ranger guided Kings Palace tour and enjoyed the talk and walk. The photo was hand held using "natural light" and shows a large overhead drapery formation. While flash is permitted the results are flat. We finished the tour at 4:00pm and headed northeast from the Guadalupe Mountains through Carlsbad to Brantley Lake State Park in the Chihuahuan Desert. Tomorrow we plan to visit Alamagordo, a town that looked interesting last year but we didn't tour.